Community development, and our focus on girl’s empowerment, is an act that takes daily practice which is strengthened by continual critique, analysis, and optimism. The brisk winter air skims my face as I leave for work from the warmth of morning chai with my host family. My morning commute takes me through a tunnel of shop owners opening business for the day, charcoal and vegetable stands, and eventually through Kibera Drive, which leads me directly to Carolina for Kibera in Olympic Estate. I pass the same businesses later in the afternoon, and with a warm setting sun, we are much more likely to greet each other with a simple “Sasa" or "Habari yako?” through the crowded streets of zooming matatus and school kids in uniforms. As a Peacock Fellow, I supported the Binti Pamoja | Daughters United Core program, which is part of the girls’ empowerment program at CFK. My focus has been to develop a five-day training program for the Girl’s Parliament, which will involve twenty-four teenage mothers from all districts of Kibera on building their own advocacy project. Each girl is democratically elected and responsible for representing their position, perhaps focusing on a certain topic like environmental awareness, girls’ wellbeing, or community security. Some of these girls are mentored by young women who will be part of a story-telling and photography project to raise awareness about their own importance in Kibera’s development and lives of their mentees. 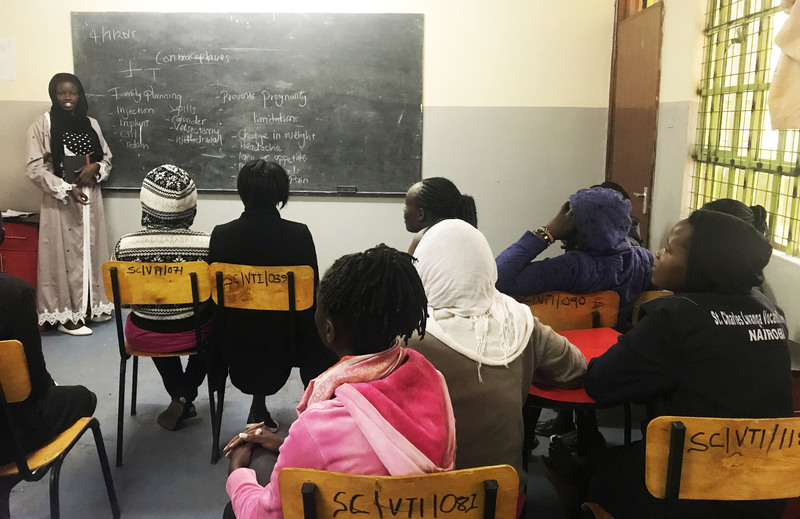 Girls gather together for a life skills program facilitated by a mentor with the Binti Pamoja program. Through the length of my fellowship with CFK, the deep commitment of our work in the community allowed me to see the true purpose of it; belonging to a community and acting on the opportunity for change. The Binti Pamoja staff has granted me the ability to be creative and artistic with the changes they hope to see for their community,and has certainly embraced me as part of their team. During our time together, they brought me to attend safe space meetings for teenage mothers, teacher conferences, radio talk shows, and discussions with mentors and mentees in different districts in Kibera. We discussed with great detail and analysis the strength of change for young girls to envision themselves as change makers, using knowledge about sexual and gender based violence to create safer environments, and the strong community environment in Kibera. The wider team at CFK made the office a collaborative and entertaining environment, but also one that deeply cares about the wellbeing of each individual. We bonded specifically over a team-building day in Lukenya, and playing soccer together so roughly that the grass stains in my jeans will always be a reminder of how many times I fell down and was equally supported to get back up. 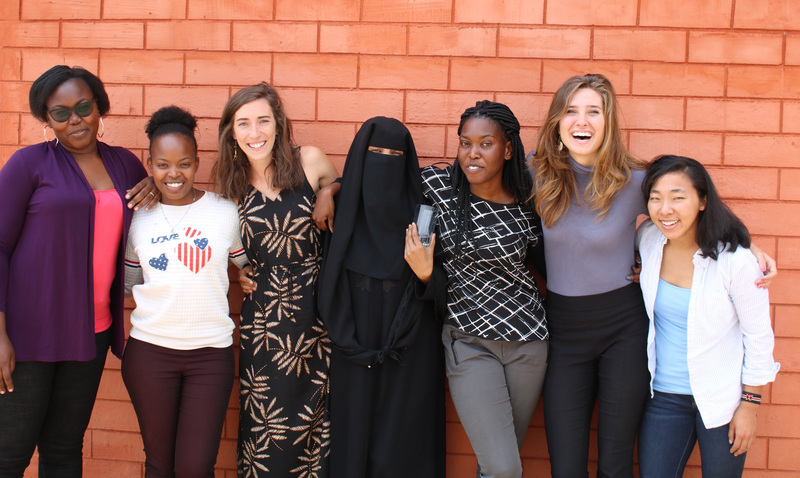 Anna with other interns and Peacock Fellows outside the Binti Pamoja Center, Summer 2018. I believe the strength of the community in Kibera comes from “sleeping with another’s burden as your own,” as Lilian, a mentor to me on the Binti Pamoja team mentioned. With selfless effort and empowerment, the Binti Pamoja team has shown me who should decide the direction for their community, and that community development is a way of life. Community development, and our focus on girl’s empowerment, is an act that takes daily practice which is strengthened by continual critique, analysis, and optimism.